This is a very interactive festival!! We don't just want you to attend...we want you to PARTICIPATE!!! What better way than to dress the part??? "But I don't own a costume!" Maybe you own a "costume".,..but you can still dress like a pirate...or a fairy...or a steampunk character!! Just raid your closet (or the closet of a friend or family!! ), make a trip to your local thrift store. You'll be able to find a goldmine...cheap!! Then you can dress up and really be a PART of the Festival! Then you'll have a start for next year's fest! You can even save your duds for an awesome Halloween costume!! Oh...by the way a pirate never dresses in a "costume"...it's called GARB!!! 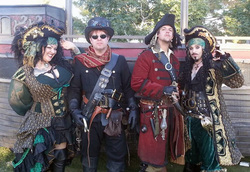 Just click on the tabs under this section for ideas on Pirate Garb, Fairey Finery, and Steampunk Style.